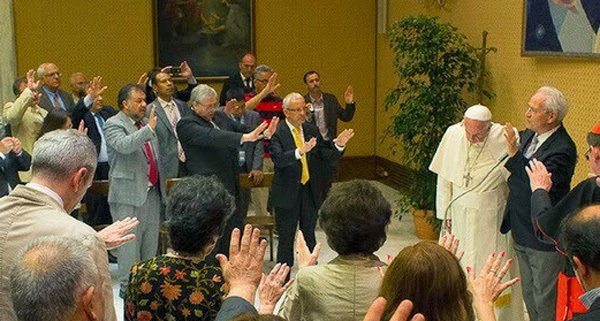 Pope Francis has invited thousands of Catholic "charismatics" and members of Pentecostal and Evangelical churches to Rome to celebrate Pentecost and mark the 50th anniversary of the so-called Catholic Charismatic Renewal. Francis, who has a history of participating in charismatic-interfaith events, will lead a prayer vigil on June 3, the eve of Pentecost, at Rome's Circus Maximus, and will offer Pentecost Mass the next morning in St. Peter's Square. Question: Why would Francis entertain a sect that is manifestly errant and which the Church has already spoken against? In May 1969, for example, Pope Paul VI publicly denounced "the illusion of a free and charismatic Christianity" which ''does not build, but demolishes," and deplored those who "have recourse to gratuitous charismatic suppositions in order to fill up the interior emptiness created by their own loss of confidence in the guidance of the Church." The Holy Father also said: "Many who speak about the Church today say they are inspired by a prophetic spirit, and they appeal to the Holy Spirit as if the Divine Paraclete were at their disposal at all times. May God grant that this presumption, of elevating a personal experience into a criterion of religious doctrine, may not cause havoc!" At his Wednesday Audience of May 17, 1972, Pope Paul again lamented the Charismatic Movement, saying that it attacks directly "the very existence of the Church," leading to "extinguishing the real flame of Pentecost, disregarding the thought of Christ and of the whole of Tradition." What he is saying is that the Charismatic Movement has no connection with the Holy Spirit, which means that Catholics should have no connection with it. The Charismatic Movement is a diabolical sect, wherein the devil presents himself as the Holy Spirit for the purpose of luring Catholics away from the institutionalized Church. This insidious movement is promoted by the Freemasons as part of their plan to destroy the Catholic Church, and is intimately connected with what has often been dubbed the "Spirit of Vatican II." Cardinal Leo Suenens who oversaw the implementation of the Worldwide Charismatic Movement in the Catholic Church was himself an initiated Freemason. He joined the Masonic lodge on June 15, 1967, under the code-name "LESU." Suenens also advocated married priests and was known for his open and hostile opposition to Pope Paul's encyclical letter on human life. The Catholic Church strictly forbids any connection with Freemasonry, which means anything the secret society advocates, i.e. charismatic seances, ecumenism, witchcraft, homosexuality, etc. Though the attendees of these "charismatic" gatherings may mean well, they are going where angels would fear to go. They call upon "the spirit," but they seem to be calling down demons. Rolling around on the floor and speaking nonsensical syllables is not a manifestation of the Holy Spirit. So what, then?! It suffices to say that the Charismatic Movement is a wing of the New Age Movement that has infiltrated the Church for the purpose of bringing about a new religion (so-called renewal). The babbling in tongues is but a surface indication of its true design, as the real purpose of this movement is to undermine the priesthood so that the authority of the priest falls into the hands of the laity, and a form of spiritual anarchy results. The fruit of the Charismatic Movement is always a challenge of the priesthood, a falling away from the Faith, and contempt for Christian morals. After all, if the Holy Spirit is speaking directly through me what need have I for the Church? The Blessed Virgin warned at Fatima in 1917 that if we did not heed Her requests to say the daily Rosary errors of Russia would spread throughout the world. This has come to pass with the implementation of Marxist principles in such a way that the "clench-fist" ideal is applied spiritually for the purpose of undermining the Church's hierarchical authority. Unfortunately, the Charismatic movement fueled the new revolution and brought about "a revolt" where the laity farcically assume priestly functions as extraordinary ministers, lectors, liturgical planners, etc. Why is Francis fueling the revolt? Because he’s part of it.